Women and children, avert your eyes. 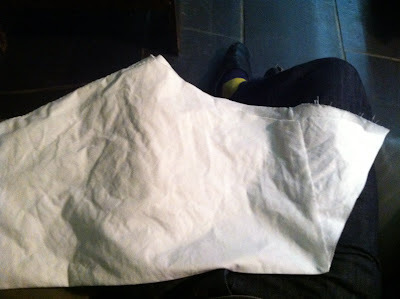 I'm making underwear! The directions for these are again straight out of the Workwoman's Guide. 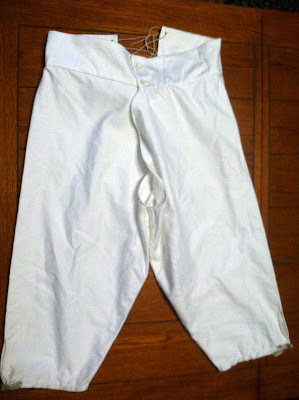 They fit just fine except that the waistband is a little short - there's a big gap in the back. It laces to fit so I suppose it's not really a problem, but it might be nice to eventually fit a new waistband so I don't have so much space in back. As with most of the directions, these are measured in nails, and start with squares and rectangles. 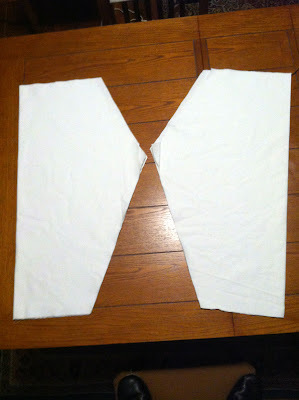 The first diagram shows how to turn a folded rectangle of fabric into the shape it needs to be. I did this by measuring and putting a pin at each of the relevant points. 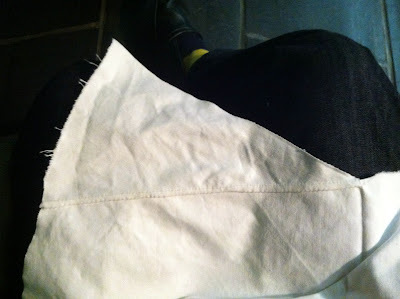 I then folded the fabric between the two pins - for instance, to get the angled line at BG (Fig 20) I put a pin at B, one at G, and folded the fabric between the two pinned points. After making a crease I then cut along the crease. Easy as pie. One thing to note is that this section of the Workwoman's Guide describes these undergarments as either "trowsers" or "drawers." They seem to be somewhat interchangeable, except that the descriptions tend to call the ones for women and children trowsers, and the ones for men drawers. I'm not sure if that's standard or if it's just what the author felt like doing. Finished! Seriously, these were pretty easy to put together so I don't have a lot of in-progress photos. 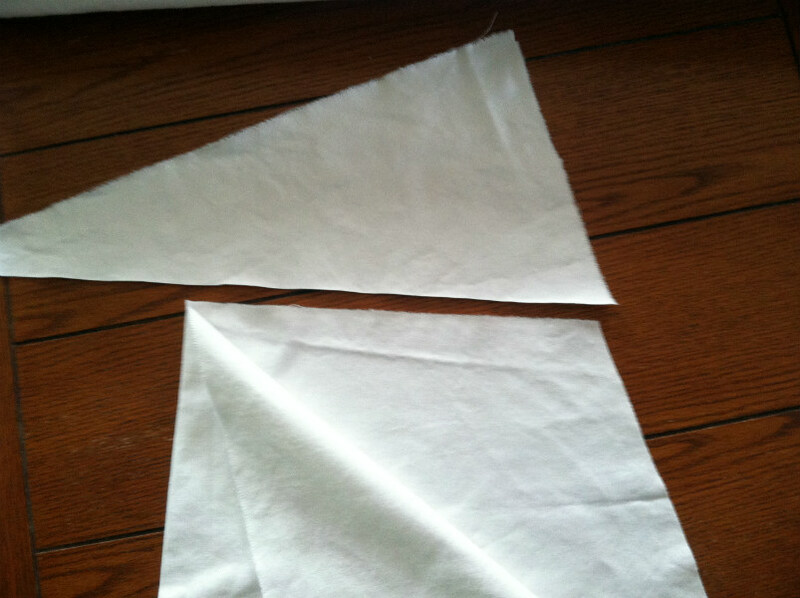 Any open hem (the front fly area and the back gusset, for instance) are finished in a rolled hem. 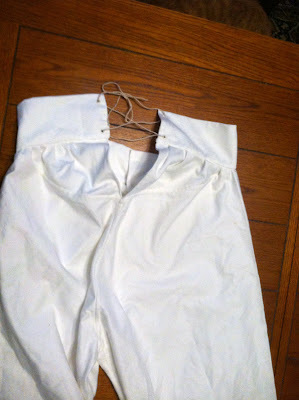 The bottoms of the legs have tape sewn into them for the linen drawstrings. I wove the back lacing on a lucet. This is the gap in the back. It might show off a nice plumber's crack, but at least they'll stay on my waist. As you can see the backs are gathered into the waistband, so if I do re-work the waistband I'll have the spare fabric to make it longer. 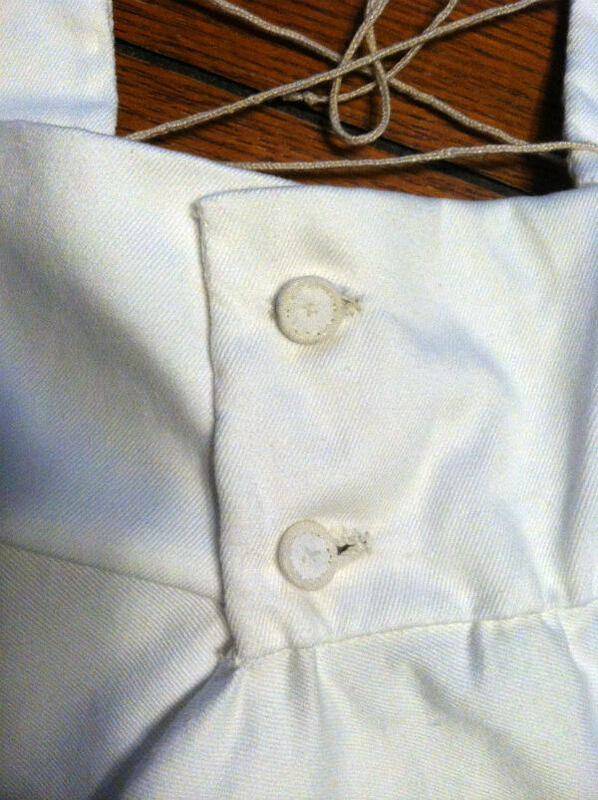 A close-up of the linen buttons. The directions said to use "metal buttons" so I used 3/8" brass rings and covered them in linen. The front fly doesn't get any closure, but the overlap is enough to keep it shut. I hope. Pretty racy stuff! I'm interested in how you made the buttons. Do you have an older post on the technique?